Dinosaurs are fascinating no matter what age. To imagine creatures so large calling Earth home is simply amazing. Little dinosaur enthusiasts love to learn about different dinosaur species, their living and eating habits, dinosaur eggs, and even fossils! 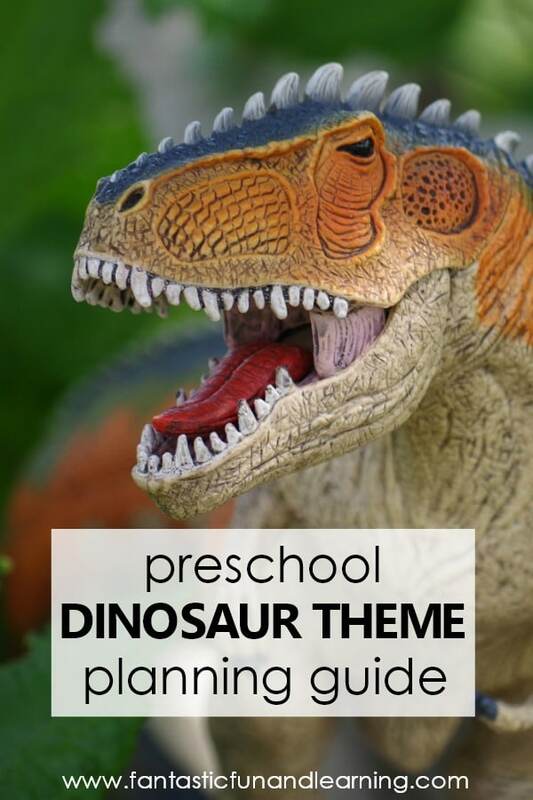 With lots of fun and learning in mind, here are some fabulous resources for planning your preschool dinosaur theme. 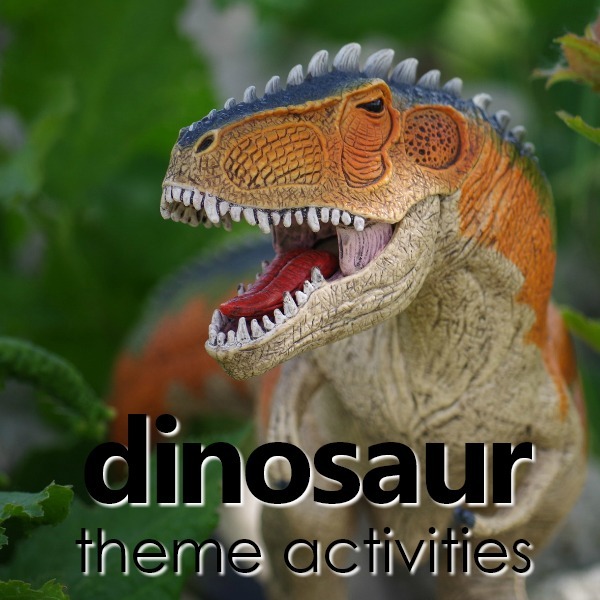 Most of these dinosaur theme preschool activities are designed for kids ages 3 through 5, but many can be modified for younger and older kids as well. So much fun learning can happen within a dinosaur theme! You can go on dino digs, excavate fossils in a sensory bin, and engage in prehistoric pretend play. 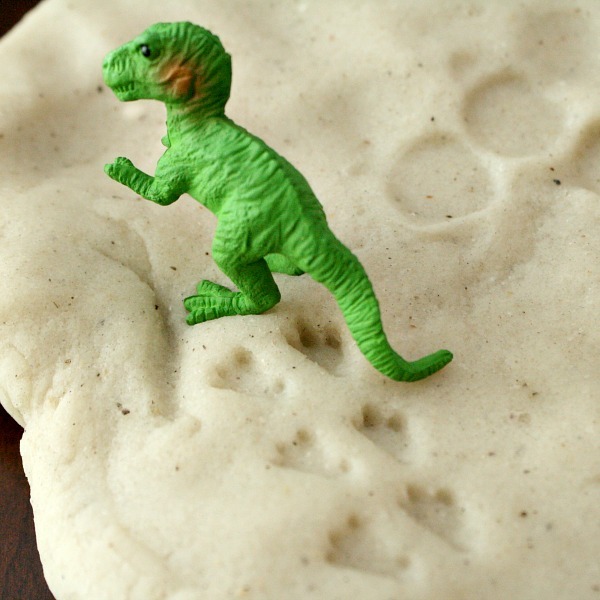 Little ones love to explore this larger than life prehistoric theme with rocks, sands, play dough, and dinosaur toys. A dinosaur theme can be taught any time of year. You may weave it in with teaching the letter “d” or if you are exploring occupations such as a paleontologist. Regardless of when you choose to teach a dinosaur theme, it’s sure to captivate little minds. If you’re planning a preschool dinosaur theme there are many possibilities for incorporating meaningful early learning skills. 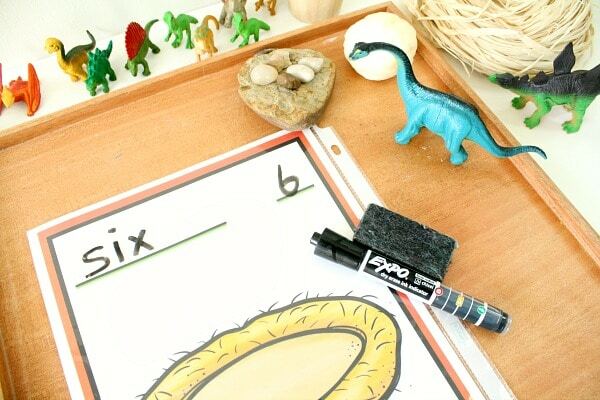 You can also use small dinosaur erasers, “dinosaur” eggs, or rocks as manipulatives for many learning activities to teach math and literacy concepts. If you get parents, friends, and family involved you can enrich the experience kids have during your preschool dinosaur theme. Here on Fantastic Fun and Learning we’ve shared the following ideas to go along with a preschool dinosaur theme. 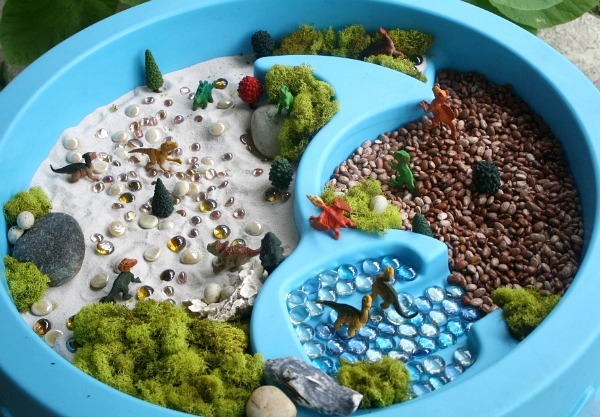 Kids will love to get their hands on this interactive dinosaur small world sensory bin. From rocks to sand, and glass pebbles for water, lots of imaginative and vocabulary building play is sure to happen! 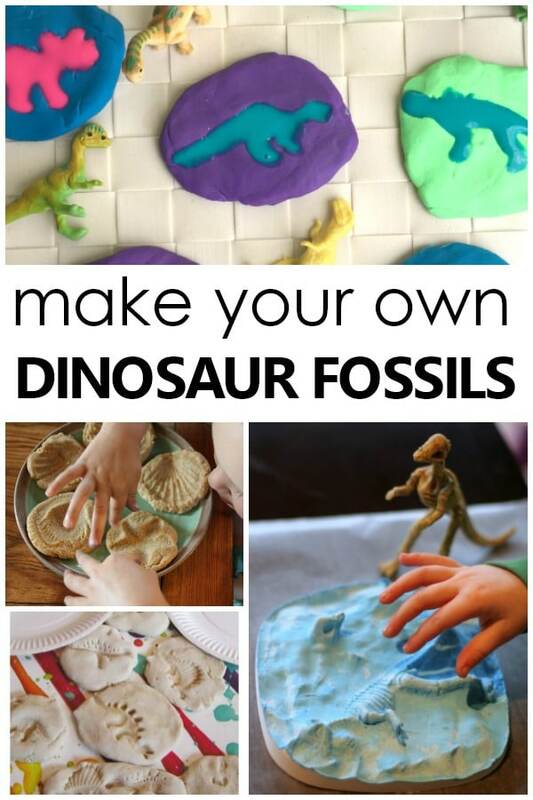 Make up a batch of your own dinosaur sand play dough, add a few dino themed loose parts, and invite kids to explore. We loved making dinosaur footprints in the play dough! 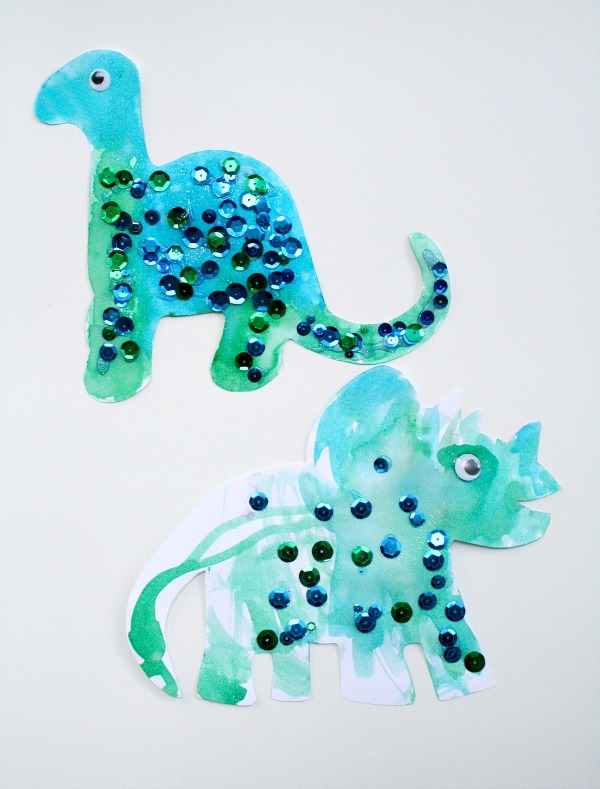 Preschoolers and toddlers will love using watercolors and sequins to create a colorful dinosaur watercolor work of art. 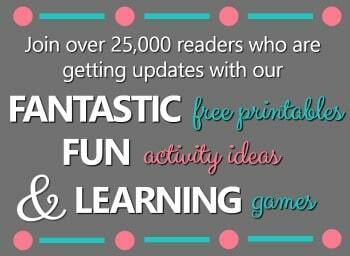 This is a wonderful resource for lots of fun learning and discovery fossil activities from other creative educators. 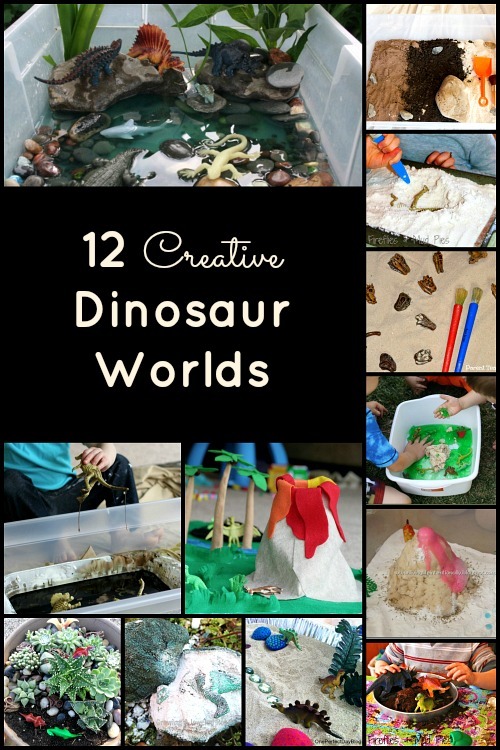 Here are some fun hands-on dinosaur small world sensory bins for little hands to explore. Learn some neat facts about a variety of dinosaurs in this series of short animated dinosaur videos. This short informational video describes dinosaur physical features, diets, and their extinction. Check out all these cool facts about the T-Rex! Join Dr. Binocs to learn about some interesting dinosaur myths. This video offers several hypotheses for dinosaur extinction. The Dinosaur Song is very informational and entertaining. You’ll learn lots about the different types of dinosaurs, their features, and history. 10 Little Dinosaurs is sung to the tune of 10 Little Indians and covers counting, number recognition, and names of dinosaurs. Get moving and stomping with the Dinosaur Stomp. This music video We are the Dinosaurs by The Laurie Berkner band is very catchy and fun for little ones. Finger plays and action rhymes are a great addition to your preschool themes. Here are a few terrific options to go along with a dinosaur theme. 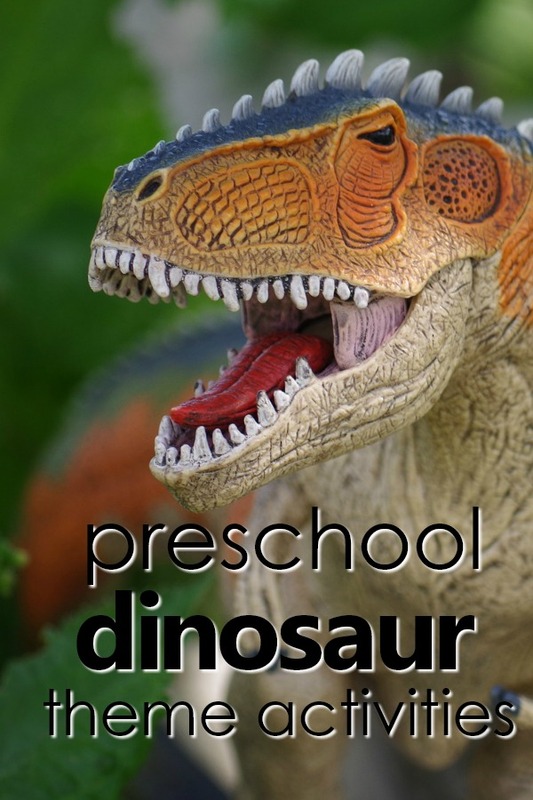 Preschool Express has a big collection of dinosaurs poems and songs for preschoolers. Kids Soup has some fun and engaging dinosaur action rhymes. This collection of dinosaur songs from Kidsparkz are sung to familiar nursery rhymes and tunes. PBS Kids has a GINORMOUS selection of dinosaur games to play online, featuring some favorite friends from Dinosaur Train. Build a dino, listen for and identify dino sounds, and even play a dinosaur Memory matching game with these fun dino games from Kids Dinosaurs. Go on some “dinoventures” with some fun online dinosaur games from GPBKids. 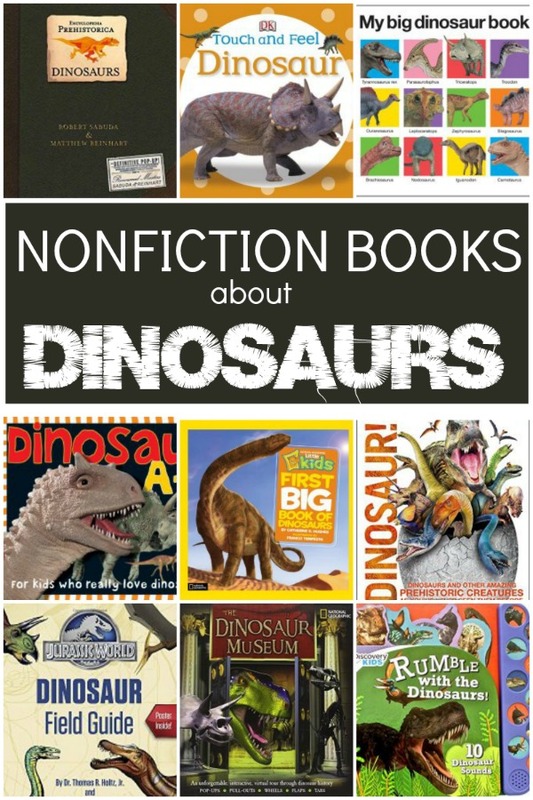 There are a ton of wonderful books to read for your dinosaur theme. 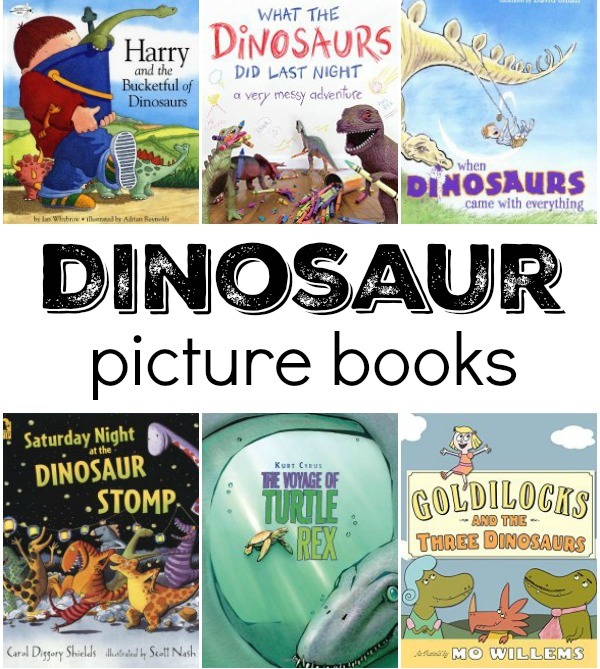 Below are some of our favorite picture books for a dinosaur theme. Bring dinosaurs to life with real photographs and nonfiction texts. Check out some of our favorite picture books about dinosaurs. Dive into a great nonfiction book about dinosaurs to learn more about these amazing creatures! 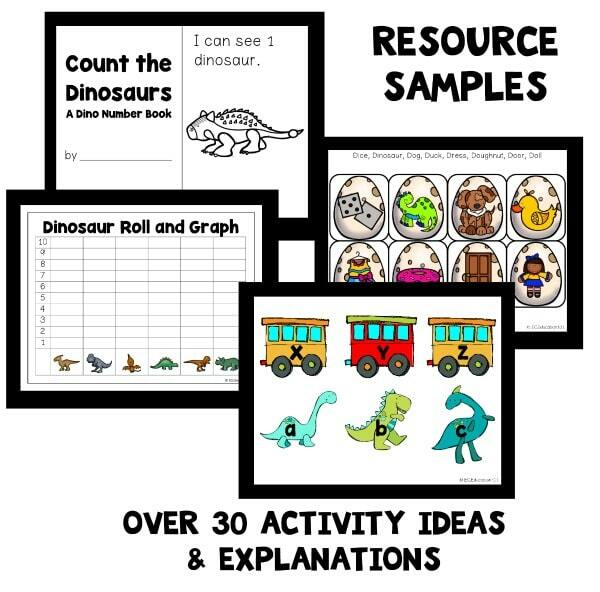 Reinforce learning with these hands-on materials for your dinosaur theme. They can be used for sensory bins, crafts, and learning activities. 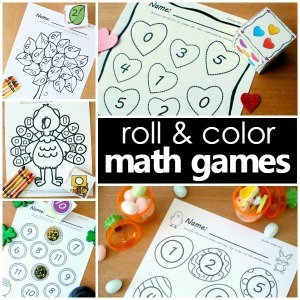 Grab some play dough to create some dinosaur eggs and practice lots of number sense and using ten frames with these free counting dino eggs play dough mats. 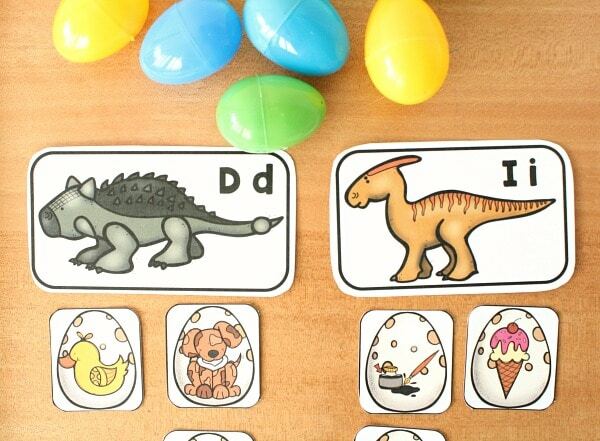 Go on a scavenger hunt for beginning sounds with this dinosaur initial sound game. Kids will get moving and have a blast finding the hidden dinosaur eggs and matching the contents inside! 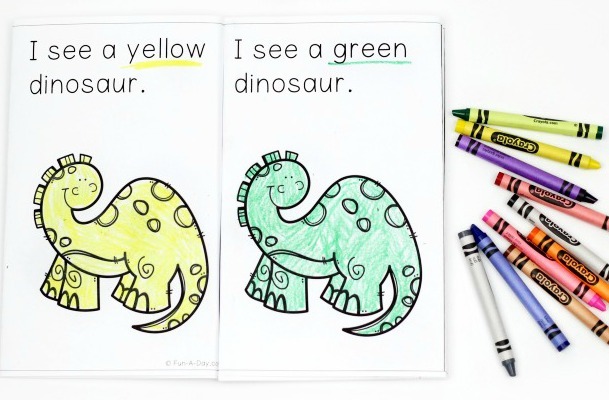 Explore color words and dinosaurs with this free printable dino book for emergent readers. Print in black and white and invite children to color the book, or use the color printed option.